What is the free fall? How to calculate air resistance? 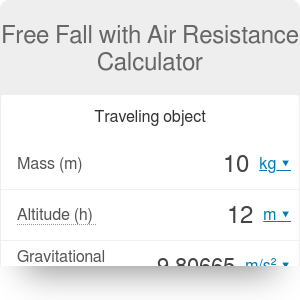 This free fall with air resistance calculator is a variation of our free fall calculator that takes into consideration not only the influence of gravity but also of the air drag force. With its help, you will be able to assess the time of fall, as well as the terminal and maximum velocity more accurately. In the text below, we will explain how this tool works. Not only will we provide you with a detailed explanation of how to calculate air resistance, but also with handy drag force equation that will make all computations a breeze! In Physics, free fall is a motion of the body where no forces, except for gravity, are acting upon it. It doesn't mean that the object has necessarily to move downwards, though - for example, we can consider the Moon to be in free fall, as it is only subject to Earth's gravitational force. In this calculator, however, we treat the term "free fall" a little less scientific and consider any object that moves towards the ground (without external acceleration or deceleration) as an object in free fall. For example, a skydiver of a parachute jumper who moves towards the ground will be in such a motion. Two forces are acting on him: one is gravity, and the other one (that causes deceleration) is called the air resistance. where v is the instantaneous speed, and k is the air resistance coefficient, measured in kilograms per meter. ρ is the density of the medium the body is traveling through. By default, our calculator assumes the density of air at the temperature of 15°C equal to 1.225 kg/m³. If you are trying to analyze the free fall in different conditions, feel free to open the advanced mode to change this value. You can also use the Stokes' law calculator to analyze a particle falling through a different medium, such as water or glycerine. A is the cross-sectional area of the falling body. C is the dimensionless drag coefficient associated with the shape of the falling body. For example, a falling cube will cause much higher air resistance than a tear-shaped object; this is why a cube has a much higher drag coefficient. The default value of k = 0.24 kg/m corresponds to a person who is skydiving. Feel free to change this value as you'd like, or open the advanced mode to calculate it with the air resistance formula. While falling, the object is steadily accelerating due to gravity. On the other hand, the air resistance force increases with velocity. At some point, the drag force will become large enough to completely oppose the gravitational force. At this point, the body stops accelerating and reaches its terminal velocity. It doesn't mean, though, that every object in free fall will reach its terminal velocity - after all, it may hit the ground before it reaches the terminal velocity. This is why our free fall with air resistance calculator will provide you with a different value: the maximum velocity that the body reaches before coming to a stop. Let's analyze an example of a skydiver falling to the ground. Our goal is to calculate the time of fall, his maximum velocity, and terminal velocity, as well as the magnitude of the drag force when he reaches his maximum velocity. Find out what is the mass of the skydiver. Let's assume it is equal to 75 kg. Decide on the altitude the skydiver is falling from - let's say it is equal to 2000 m.
Choose the air resistance coefficient (or open the advanced mode to calculate it). In this example, we will stick to the default value of 0.24 kg/m. Input all of these values into the free fall with air resistance calculator. You will automatically obtain the results: the time of fall equal to 40 seconds, a terminal velocity equal to 55.4 m/s, and a maximum velocity equal to 55.4 m/s. It seems that the skydiver has managed to reach his terminal velocity! Compare this result with the results from the free fall calculator. Can you see the difference? Free Fall with Air Resistance Calculator can be embedded on your website to enrich the content you wrote and make it easier for your visitors to understand your message.